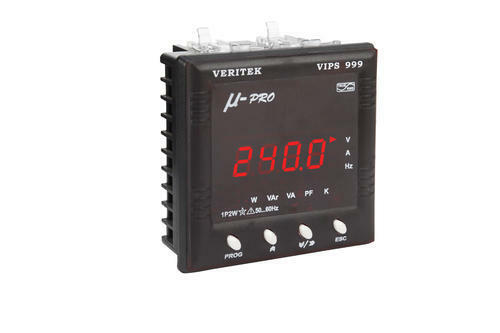 So as to fulfill the varying requisites of our esteemed customers, we are involved in providing a wide consignment of Single Phase Power Meter VIPS 999. Designed and developed with superiority, these could be purchased form us at highly reasonable rates that too in bulk. In addition to this, their obtainability with us in a range of sizes, dimensions and customized forms makes these a leading market choice. Display 7 segment LED display, 0.56"
Established in the year 1995, Veritek Engineering Pvt. Ltd. is a leading manufacturer, supplier and wholesaler engrossed in offering a wide consignment of products including Multifunction Meters, VIF Meters, Energy Meters, Digital Panel Meters, Analog Meters, PF KVAR Controller, Earth Leakage Relays, Protection Relays, Voltage and Current Transducers, Current Transformers, Control Timers and Energy Audit Supervisor. Using finest class basic material along with advanced tools and machinery, these offered products are widely recognized and cherished in the industry for its ruggedness and high strength. Also, these are tested thoroughly before getting shipped at the end of our customers. Known for their different industrial applications, these are highly demanded.